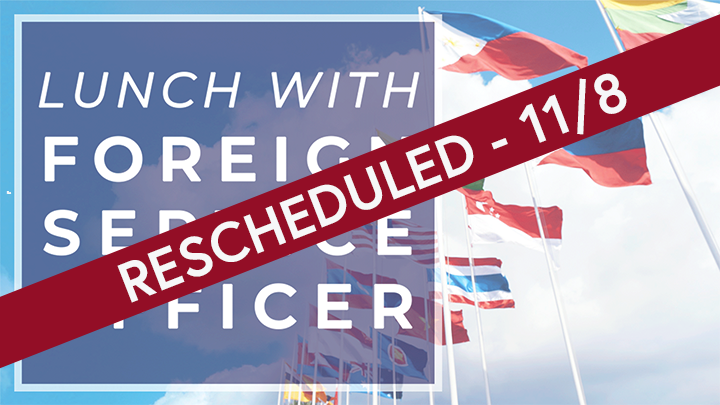 This event has been rescheduled to Thursday, November 8, 12:30PM, FedEx Global Education Center 1009. Interested in a career in foreign service? Come and talk to Justin Walls (Foreign Service Officer) about his experience as a foreign service officer currently stationed at the U.S. Consulate in Guangzhou, China, and learn all about the Foreign Service Officer Test. About Justin Walls: A native of Jamestown, NC, he graduated from Ragsdale High School in 1999 and the University of North Carolina at Chapel Hill in 2003. He holds an MA from Johns Hopkins Nitze School of Advanced International Studies and is a former Peace Corps Volunteer in China. He speaks French, Spanish, Mandarin Chinese, and Thai.